Learn how to pursue contracting opportunities with the State! Our Contracting 101 class is geared towards teaching vendors the basics. 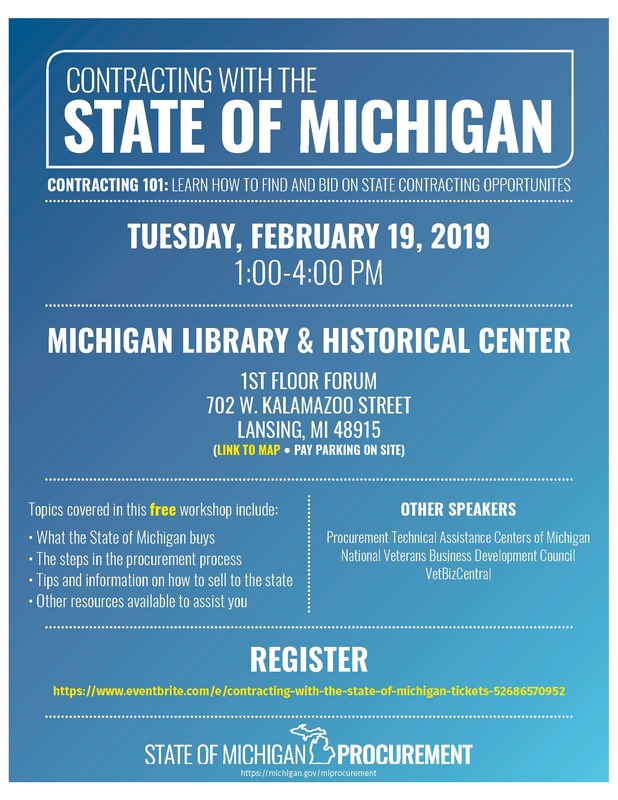 Join State of Michigan Procurement for a Contracting 101 presentation at the Michigan Library and Historical Center on Tuesday, February 19, 2019. This event will provide a general overview on how to contract with the State of Michigan as a vendor. They'll share information and tips on how to register as a vendor, bid on solicitations, and much more! They'll also have guests from VetBizCental and Procurement Technical Assistance Centers of Michigan. VetBizCentral share tips and insights on programs specific to veterans and NVBDC.